We call on you to take immediate action to protect the COP21 climate talks happening in Paris this December and all future negotiations from the influence of big polluters. 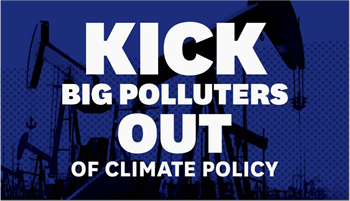 Given the fossil fuel industry’s years of interference intended to block progress, push false solutions, and continue the disastrous status quo, the time has come to stop treating big polluters as legitimate 'stakeholders' and to remove them from climate policymaking. Corporate Accountability International will deliver this message and the list of signatures and comments to the COP21 climate talks in Paris. 11951 3.4 years ago Anonymous Kansas City, MO , US who put these corporations in bed with the cop?